The 6th Asian Film Festival in Jeddah, organized by the Asian Consuls General Club (ACGC), which began on March 21st and will run until April 4th, is screening 11 films from 11 different Asian nations. 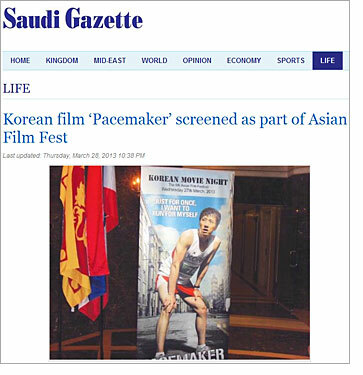 The representative for South Korea at this year’s edition was Pacemaker, which screened on Wednesday, March 27th. Following its debut on Korean screens during 2012’s Lunar New Year holiday weekend, the inspirational marathon drama Pacemaker has been invited to a number of film festival, including the Fukuoka International Film Festival and the London Korean Film Festival. Starring KIM Myung-min as a middle-aged long distance runner, as well as AHN Sung-ki and GO A-ra, Pacemaker is a story of determination where one man fights to reach his goal against all the odds. Korean Consul General SHIN Yong-gi held the screening at his residence, where he and his wife hosted over 100 guests.